The town of Garryowen was named after the old Irish tune "Garry Owen" which was one of Lt. Col. George Armstrong Custer's favorite marching songs. "Garry Owen" is an old Irish quick-step that can be traced back to the 1800s. it is known to have been used by Irish regiments as a drinking song. So the story goes, one of the Irish "melting pot" members of the 7th Cavalry was singing the song under the influence of spirits, and Custer happened by, liked the rhythm, and soon began to hum the tune. Garryowen is derived from Gaelic meaning Owen's garden, which is a suburb of Limerick, Ireland. The tune has a fast paced and lively beat. The song was adopted as the regimental song soon after Custer arrived to take over the 7th Cavalry. It was the last song played by the band for Custer's men as they left the Terry column at the Rosebud River and rode into history. A registered historic site, Garryowen, the only town within the Battlefield is located at I-90 Exit 514 just south of the Little Bighorn Battlefield National Monument and Custer National Cemetery. The site is just one hour's drive from Billings, Montana or from Sheridan, Wyoming. The Battle of the Little Bighorn began on this quiet riverbank when 7th Cavalry troops attacked Sitting Bull's camp in the first military action of the West's most famous battle. This grassy riverbank is where Major Marcus Reno's troops attacked Sitting Bull's camp on the afternoon of June 25th, 1876 under Lt. Col. George A. Custer's command. For a century the battle was known as "Custer's Last Stand" or the "Custer Massacre". The Tomb of the Unknown Soldier is the burial site of one of the first casualties of the Battle of the Little Bighorn. The granite tomb was dedicated during the Burial of the Hatchet Ceremony in 1926 at Garryowen, during the 50th Anniversary of the Battle of the Little Bighorn after the discovery of the Unknown Soldiers body when building the interstate. White Bull Sioux Indian, and General Godfrey performed the ceremony in front of 50,000 observers. The Granite "Peace Memorial" behind the Tomb was dedicated on the 125th Anniversary of the Battle of the Little Bighorn. The town is now privately owned and operated by Christopher Kortlander. It is the site of the Custer Battlefield Museum, Garryowen Trading Post, a Federal Post Office, Conoco Gas Station, convenience store, Subway sandwich shop, Historical Rarities and rest area. please feel free to call 406-638-2020. We receive many requests for the song of Garryowen. The Custer Battlefield Museum has them available at www.custermuseum.org we have provided the Lyrics below. And clearing all before us. 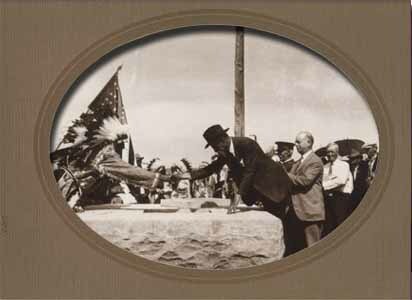 Burying of the Hatchet, White Bull a Sioux Indian Chief, and General Edward Godfrey bury the hatchet in the grave of the Unknown Soldier at Garryowen, Montana. It was near this sight that Custer divided his forces and began his attack against Sioux, Arapahoe and Cheyenne that were camped within the valley of the Little Bighorn. Last revised: November 29, 2005.